If you were to list one of the most important pieces of equipment in your home, chances are your water heater would be near the top of that list. Without your water heater, you would not be able to access hot or warm water which would make it very hard for you to do daily tasks including showering and washing dishes. 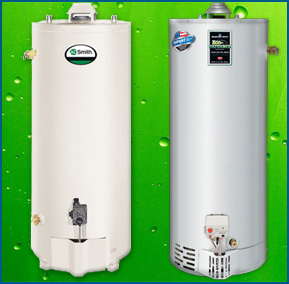 Storage tank water heaters are the most common type and the best water heaters to buy. These units have an insulated tank where water is heated and stored until it's needed. Storage tank water heaters are designated by the amount of water they hold in gallons. Tank size is one of the major considerations when purchasing one of these water heaters. Water heating efficiency is measured by an Energy Factor (EF) rating. The higher the EF, the more efficient the model. Our team at Harry Clark Plumbing can assist you in deciding which model would be best suited for your individual needs. If you have questions or want to schedule a consultation, contact us today. Storage water heaters come in a variety of sizes, so you can be sure you'll find the right model to suit the needs of your home. Most often, you will find water heaters in sizes that hold from 20 gallons up to 80 gallons. These types of water tanks offer a large and steady supply of hot water that can be dispersed through your whole home. Additionally, storage water heaters are less complex which means that installation, repairs and routine maintenance are affordable. Periodic maintenance can significantly extend the life of your water heater and minimize loss of efficiency. To ensure your household has ample water supply and to maximize efficiency, you need to make sure you are purchasing a properly sized water heater for your home. First hour rating is the number of gallons of hot water the heater can supply per hour, starting with a full tank of hot water. You will want to maximize both your energy and savings, so use the energy factor to determine the energy efficiency. The higher the energy factor, the more efficient the water heater will be. This water heater features intelligent gas control with diagnostics, has a built in "piezo" igniter, is FVIR compliant, and is available in 30, 40, 50, and 75 Gallon Capacity. It's made in America. This unit has intelligent Controls, Self powered electronic gas valve, FVIR compliant and is available in 30, 40, 50, and 75 gallon capacity. Harry Clark sells the Bradford White and A.O. Smith as equals. Tank water heaters answer to "tankless" this water heater has faster recovery than standard tank water heaters and has unmatched performance. This unit features spiral heat exchanger. Use PVC or ABS for venting. Can be vented through wall or through roof. Advanced electronic controls, large LCD display, advanced diagnostics, and commercial grade glass lining. For more information about storage water heaters, or to schedule a consultation, contact us today.